Schools of nursing and allied health use the Test of Essential Academic Skills (TEAS) to assess applicants for admission. 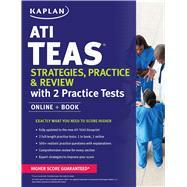 In August 2016, the ATI TEAS replaced the TEAS V. With exam-focused instruction and targeted practice, Kaplan’s ATI TEAS Strategies, Practice & Review with 2 Practice Tests provides the comprehensive preparation you need to achieve the best score possible and get into the school of your choice. Since 1982, Kaplan Nursing has been providing the nation’s leading NCLEX-RN® Examination Review. Led by experienced nurse educators, Kaplan Nursing prepares thousands and thousands of nursing students for the NCLEX-RN® examination each year. With our focus on industry-leading service, great value, and ease of use, we provide benchmark and predictive testing for both RN and PN/VN programs. For more information, visit us at kaplannursing.com.